ca 550 - 520 B.C. Sides: A pair of Gorgons stride through the air. 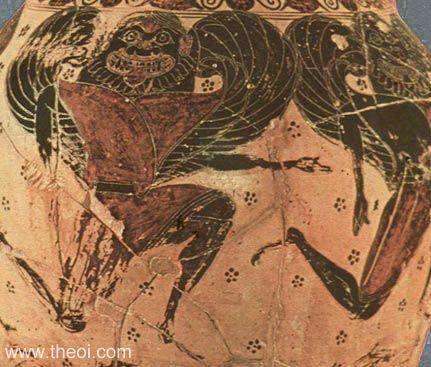 They monsters are depicted as winged woman with round heads, large, staring eyes, flaring nostrils, wide, toothy grins, lolling tongues and thick beards. Neck: Heracles and the centaur Nessus (see other image).